This article is about the Little Richard song. For the New Order song, see Tutti Frutti (New Order song). "I'm Just a Lonely Guy"
In 2007, an eclectic panel of renowned recording artists voted "Tutti Frutti" No. 1 on Mojo's The Top 100 Records That Changed The World, hailing the recording as "the sound of the birth of rock and roll." In 2010, the U.S. Library of Congress National Recording Registry added the recording to its registry, claiming the "unique vocalizing over the irresistible beat announced a new era in music". In April 2012, Rolling Stone magazine declared that the song "still contains what has to be considered the most inspired rock lyric ever recorded: 'A wop bop alu bop, a wop bam boom!' "
Although "Little Richard" Penniman had recorded for RCA and Peacock Records since 1951, his records for them had been relatively undistinguished, and they had not resulted in the commercial success for which his producers had hoped. In February 1955, he sent a demo tape to Specialty Records, which was heard by Specialty owner Art Rupe. Rupe heard promise in the tapes and arranged a recording session for Little Richard at Cosimo Matassa's J & M Studio in New Orleans in September 1955, with Fats Domino's backing band and Robert "Bumps" Blackwell as producer. The band included Lee Allen and Alvin "Red" Tyler on saxophones, Huey Smith on piano, Frank Fields on double bass, Justin Adams on guitar and Earl Palmer on drums. After this lively performance, Blackwell knew the song was going to be a hit, but recognized that the lyrics, with their "minstrel modes and sexual humor", needed to be revised for lyrical purity. Blackwell contacted local songwriter Dorothy LaBostrie to revise the lyrics, with Little Richard still playing in his characteristic style. According to Blackwell, LaBostrie "didn't understand melody" but she was definitely a "prolific writer". In addition to Penniman and LaBostrie, a third name—Lubin—is credited as co-writer. Some sources considered this a pseudonym used by Specialty label owner Art Rupe to claim royalties on some of his label's songs, but others refer to songwriter Joe Lubin. 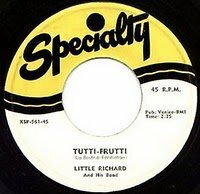 As possible evidence that the "sexual song" theory was created later, songwriter LaBostrie was quoted as saying, "Little Richard didn't write none of 'Tutti Frutti'. I'll tell you exactly how I came to write that. I used to live on Galvez Street and my girlfriend and I liked to go down to the drug store and buy ice cream. One day we went in and saw this new flavor, Tutti Frutti. Right away I thought, 'Boy, that's a great idea for a song'. So I kept it in the back of my mind until I got to the studio that day. I also wrote the flip side of 'Tutti Frutti', 'I'm Just A Lonely Guy', and a spiritual, 'Blessed Mother', all in the same day." LaBostrie was still receiving royalty checks on the average of $5,000 every three to six months from the song in the 1980s. Blackwell said time constraints prevented the development of a new arrangement, so Little Richard recorded the revised song in three takes, taking about 15 minutes, with the original piano part. The song was recorded on September 14, 1955. Released on Specialty 561, the record entered the Billboard Rhythm and Blues chart at the end of December 1955 and rose to No. 2 early in February 1956. It also reached No. 21 on the Billboard pop chart. In the UK, it only scraped into the top 30 in 1957, as the B-side of "Long Tall Sally". The song, with its twelve-bar blues chord progression, provided the foundation of Little Richard's career. It was seen as a very aggressive song that contained more features of African American vernacular music than any other past recordings in this style. Richard's contract with Peacock had been purchased by Specialty Records owner Art Rupe, who also owned the publishing company that bought Richard's songs. Specialty's deal with Richard was typical of most record companies's dealings with their artists. "Tutti Frutti" provided the title for one of the earliest books about the development of rock and roll and pop music from the 1950s, Nik Cohn's "Awopbopaloobop Alopbamboom" (1969). In 2010, the US Library of Congress National Recording Registry added the recording to its registry, stating that the hit, with its original a cappella introduction, heralded a new era in music. Combining elements of boogie, gospel and blues, the song introduced several of rock music's most characteristic musical features, including its loud volume and vocal style emphasizing power, and its distinctive beat and rhythm. The beat has its roots in boogie-woogie, but Richard departed from its shuffle rhythm and introduced a new distinctive rock beat. He reinforced the new rock rhythm with a two-handed approach, playing patterns with his right hand, with the rhythm typically popping out in the piano's high register. The song's new rhythm became the basis for the standard rock beat, which was later consolidated by Chuck Berry. In 2007, an eclectic panel of renowned recording artists voted "Tutti Frutti" No. 1 on Mojo's The Top 100 Records That Changed The World, hailing the recording as "the sound of the birth of rock and roll." The song is No. 43 on Rolling Stone's list of The 500 Greatest Songs of All Time. In April 2012, Rolling Stone magazine declared that the song "still has the most inspired rock lyric on record." The song has been covered by many musicians. Recording cover versions of songs was standard industry practice during the 1940s and 1950s. A hit song could generate many different versions: pop and instrumental, polka, blues, hillbilly and others by a variety of artists. After Pat Boone's success with "Ain't That a Shame", his next single was "Tutti Frutti", markedly toned down from the already reworked Blackwell version. Boone's version made No. 12 on the national pop chart, with Little Richard's trailing behind reaching only No. 21 in February 1956. Boone himself admitted that he did not wish to do a cover of "Tutti Frutti" because "it didn't make sense" to him; however, the producers persuaded him into making a different version by claiming that the record would generate attention and money. They didn't want me to be in the white guys' way. ... I felt I was pushed into a rhythm and blues corner to keep out of rockers' way, because that's where the money is. When "Tutti Frutti" came out. ... They needed a rock star to block me out of white homes because I was a hero to white kids. The white kids would have Pat Boone upon the dresser and me in the drawer 'cause they liked my version better, but the families didn't want me because of the image that I was projecting. Elvis Presley recorded the song and it was included in his first RCA album Elvis Presley March 23, 1956. Presley's version uses "A-wop-bop-a-loo-bop-a-lop-bam-boom!" for every verse, finishing the phrase with "bam-boom" instead of "bom-bom". Elvis' cut of "Tutti Frutti" was also released as part of a four track EP (RCA EPA-747) and as the b-side of "Blue Suede Shoes" (RCA 47-6636) which reached #20 on the 'Billboard' chart. Little Richard re-recorded the song in 1964 for Vee Jay Records' Little Richard's Greatest Hits and again in 1978 for a K-tel compilation titled Little Richard Live. ^ White, Charles (2003), pp.49-51 The Life and Times of Little Richard: The Authorised Biography. Omnibus Press. ^ "The Current from". Minnesota Public Radio. Retrieved 2015-11-09. ^ a b Michael Campbell; James Brody (2007-02-27). "Rock and Roll: An Introduction". Books.google.co.uk. p. 115. Retrieved 2015-11-09. ^ "The Full National Recording Registry: National Recording Preservation Board (Library of Congress)". National Recording Preservation Board. Retrieved 2012-12-29. ^ O'Donnell, Bernard (June 23, 2010). "'Tutti Frutti' Joins National Music Registry". Retrieved 2012-12-29. ^ White, Charles (2003), p.55 The Life and Times of Little Richard: The Authorised Biography. Omnibus Press. ^ a b Lhamon, W.T.. Deliberate Speed: The Origins of a Cultural Style in the American 1950s. USA: The Smithsonian Institution, 1990. ^ "Dorothy Labostrie". Rockabilly.nl. Retrieved 2015-11-09. ^ "A sample of 100 rock and roll songs". Icce.rug.nl. 2003-04-06. Retrieved 2015-11-09. ^ "Little Richard". Soulfulkindamusic.net. 1932-12-05. Retrieved 2015-11-09. ^ "Culpeper Star-Exponent : News". M.starexponent.com. Retrieved 2010-09-18. ^ "Rocklist.net...Mojo Lists". Rocklistmusic.co.uk. Retrieved 2017-08-30. ^ "Little Richard - Tutti Frutti Tops World-Changing Hit List". Contactmusic.com. May 16, 2007. Retrieved 2017-08-30. ^ "All US Top 40 Singles for 1956". Top40Weekly.com. Retrieved January 7, 2019. ^ Harrington, Richard. "'a Wopbopaloobop'; and 'Alopbamboom', as Little Richard Himself Would Be (and Was) First to Admit." The Washington Post 12 Nov. 1984, Final ed., sec. C1.